Thank you Freshly Picked for partnering with me on today’s post. As always, all opinions are my own. After my baby shower, I remember going through the incredibly thoughtful gifts we were spoiled with, while anticipating Harley’s arrival. As I was organizing it all, the emotions started taking over. The nerves…the excitement…the fear….the joy. I started envisioning all of the birth stories that my friends experienced, wondering how it was gonna play out for me. Probably NOT the best idea by the way! I totally freaked myself out! Anyway, when I took the two pair of Freshly Picked moccs out of the cute little bags they came in, my mind completely switched gears. I started focusing on what life is going to be like when she’s here and how for the better our world would be changed. Of course, I couldn’t help but plan her outfits and just get SO excited thinking about how adorable she’s going to look! I realize shoes for infants are not a necessity, but Harley was born in Charlotte a few weeks before the cool, fall weather began. We also spent part of winter up in New York. AND, let’s be real…these moccasins couldn’t be cuter which is reason enough in my book to put them on her! It’s safe to say that Harley is her shoe-loving mother’s daughter, especially when it comes to her Freshly Picked moccs. The leather is soft and molds to her feet. The elastic band makes it easy to put on and take off. Harley is even able to put them on all by herself without my assistance! She says, “No Momma, Harley do it.” Miss Independent I tell ya! They’re lightweight and not bulky at all, making it super easy to just throw a pair in my bag. Even though babies grow quickly, out of all of her shoes, I find Freshly Picked moccasins to last the longest because the leather stretches as her feet grows. Do you remember how little Harley was here?! And this post of her is one of my favorites to date! I can not believe she is turning TWO on Saturday!!! Where has my baby gone?!! [Insert ugly cry face here.] We have so many amazing memories of Har in her Freshly Picked moccasins and I know we’ll continue to make a million more! Because we love them so much, Harley and I are teaming up with Freshly Picked to gift one of our readers a pair of their choice! Be sure to follow along on Instagram, so you can enter in the giveaway. It will be live within the next 6 days!! You two are adorable!! Love her moccasins! How adorable! Loving seeing the little ones in the photos. Happy Tuesday! Your little is adorable! 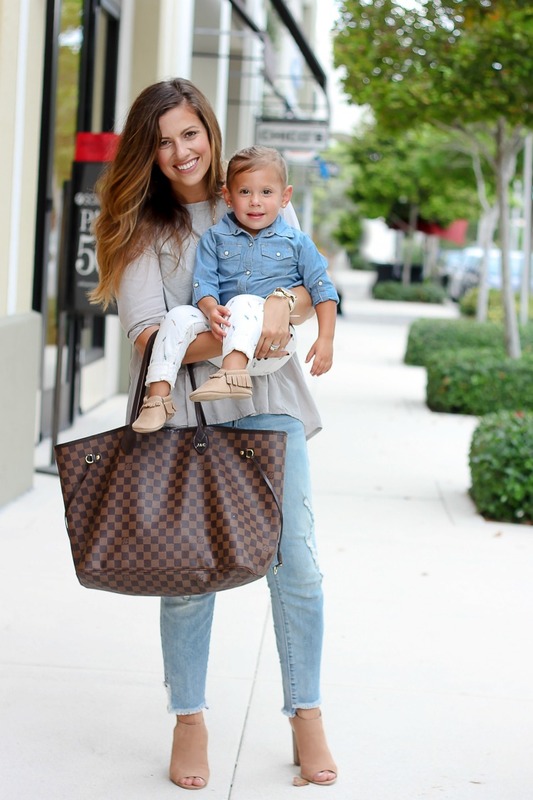 She has such cute style and looks just like you! These photos are too cute! I love your whole outfit!! Freshly picked is seriously so cute! When I have kids I am going to buy a pair in every color! Thanks for sharing! I love love love your outfit!!! I have those jeans, too, and now need to add this top to my wardrobe! You both are just adorable! Great post! I absolutely love your top and Harley is so adorable! You guys are adorable! Love those moccs! OH MY WORD!!! I cannot get over this shoot and I remember all those emotions TOO well that you described in that first paragraph when I was pregnant with Ava… not a joke!!! I LOVE those mocs so much babe!! what a cutie and I love their shoes! No kids for me yet, but when I do I hope they are as cute as yours! Both of your outfits are perfection! Love it! And I love FP! 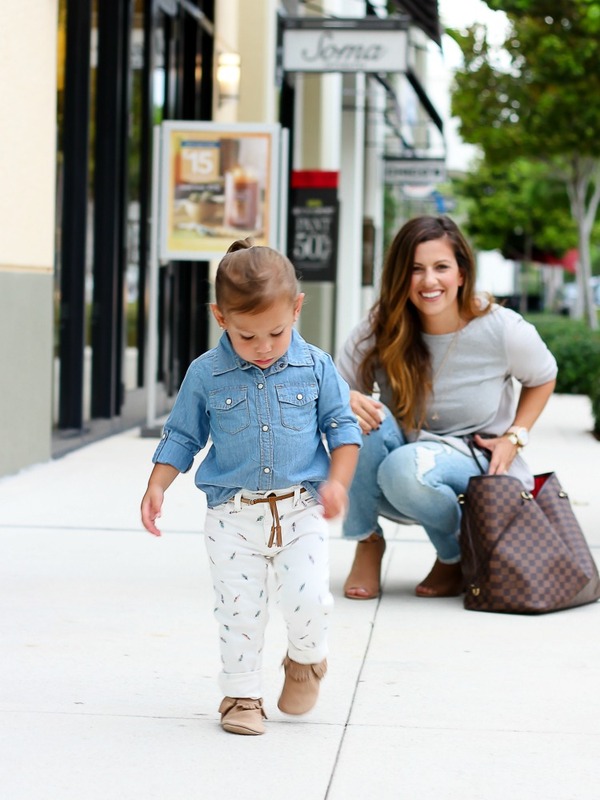 I love that your outfits compliment each other, and are not identical—although I wouldn’t mind having a pair of mocs like that in adult size, right?! These are so cute! Also I LOVE your shoes!